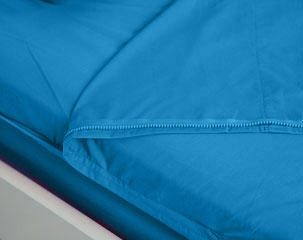 Kids Zip Sheets are a type of Zip Bedding designed to prevent children from kicking off or tangling in their sheets. The flat sheet is attached to the fitted sheet with zips either side to allow for easy entrance and exit while still allowing ventilation for the feet at the end of the bed. 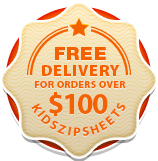 We are the first to produce a zippered toddler bed sheet set that allows the top sheet to fold down onto itself with press-clips. This ‘short sheeting’ method allows you to shorten the top sheet to various lengths depending on the age and height of your young child. Kids Zip Sheets have been tested and meet CPSC safety standards. They are free from Lead, toxic Metals andPhthalates and DO NOT pose a choking, aspiration or ingestion hazard. However, it is important to use these sheets with the appropriate age range for children. They are not to be used with infants or babies.